Old Palapye, in eastern Botswana, is the first settlement to be established as a city in Botswana in the 19th century. But instead of flourishing into a metropolitan, the place regressed into a small settlement that was eventually classified a heritage site, today. There is Old Palapye; and there is Palapye. These are two different places. Palapye is the more popular; and modern. Old Palapye is located within the Tswapong region in the central district. The settlement is 20km to the east of Palapye. Even though Old Palapye is referred to as Malaka, Malaka residents consider the place to be within their village rather than to be viewed as one area. It was named Old Palapye because of the ancient nature of the place and to distinguish it from Palapye. The name Palapye was originally spelled as 'Phalatswe' which means the 'place of impalas'. The name was borrowed from the prominent hills north of Malaka on the north-west rim of the Tswapong Hills. Old Palapye was established by Khama III and was destined to be the capital of Bamangwato people in 1889. Just as having moved to Old Palapye from Shoshong because of water shortage in the latter, and not being a good strategic trade control centre, Khama also eventually abandoned Old Palapye for the same reason when he eventually moved and settled in Serowe. Shoshong village which is 80km to the west of Old Palapye, was originally intended to be the Bamangwato's capital too. Of course, their coming into the Tswapong area was not without drama. When Khama III arrived to establish the capital at Old Palapye he encountered a small group of Batswapong people at Dekgopheng who resisted the occupation, but he demanded and prevailed in moving them to Motlhabaneng on the southern edges of Malaka. And this signaled the beginning of the integration of Batswapong people into the Bamangwato. 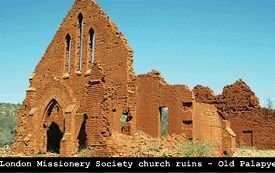 What is visible today in Old Palapye are the structures for trading stores, elementary school, prison and churches; all of European architectural design. It was an area blossoming into a city estimated to have had 30,000 people in 1892. Khama III had also intended to build an industrial college in Old Palapye however this did not materialize. This was after he had refused to give the London Missionary Society church some land, and in retaliation the church chose to build the school in Tigerkloof, South Africa. This school was later to become the training base for most of the earlier Batswana scholars and leaders. Khama III decided against Old Palapye continuing as the Bamangwato capital because of its receding water resources. By his decree all Bamangwato people were told to dismantle and leave the capital city after 13 years of occupation. The Bamangwato relocated to Serowe village which has since been their final settlement and capital of central district. And this halted the growth of the Old Palapye into a city. At the time, Khama's wife Mmabesi died and was buried in a cemetry close to the LMS church where her grave can be found today. She was most revered by the Bamangwato that they informally named Serowe Ga Mmabesi-a-Khama (place for Mmabesi Khama) in her honour. old Palapye is one of Botswana's hidden treasures because of the beauty of its natural landscape. Thus, in 2006 the place was declared a national monument. A team of archeologists, architects and historians together with the local community of Malaka has chosen to revitalize the area. The place is said to have powers of ancestral spirits, and even more-so there are areas where human presence is forbidden. Visitors to Old Palapye have found it to be a buzzing place for adventure with its stand out monument features.